Remind me the song « The Last in Line « about him. He has inspired many metal bands. 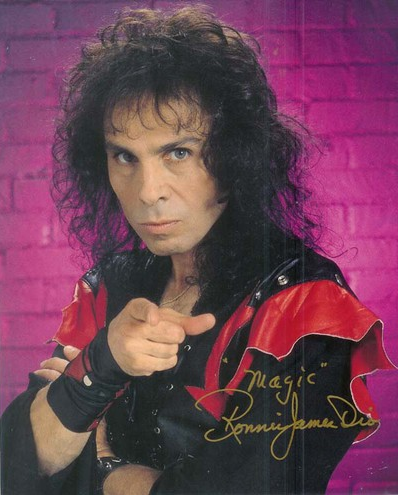 I never really listened to much Ronnie James Dio or Rainbow. I do remember this song. @Sary wrote: I never really listened to much Ronnie James Dio or Rainbow. No, glam rock was 70s bands like The Sweet and Kiss and then there was 80s glam metal like Mötley Crüe, Poison and Vixen https://en.wikipedia.org/wiki/Glam_metal Dio was simply 'heavy metal' that would now be called trad metal or melodic metal. He had a very good voice ,so strong for such a tiny man. It probably is the 1980s fashion and long hair makeup that give the glam vibe. I like the ending of Man on the Silver Mountain with the pyrotechnics, so spectacular! The other song I can't quite remember ? It is hard to say who is better for Black Sabbath. Ozzy has a unique voice which worked well with the early Sabbath music. I'v heard Dio do better with the Ozzy songs than on that video. And to be fair, we should look at some of the songs Dio wrote with Black Sabbath after replacing Ozzy. It is funny how the people that you meet in course of life influence ones taste and view of the world. I like the melancholic but hopeful lyrics of this song,It suits my overall mood. I like the melancholic but hopeful lyrics of this song. It suits my overall mood. It reminds of when I went on holiday to Jersey (the Channel island) as a teenager. I bought the album which that song is from, Mob Rules, with another BS album and Rainbow's Long Live R'n'R. Listening to them for the first time was the best part of the holiday! You were very lucky to have had a turn table at your holiday retreat....what luck to be able to enjoy your metal music. Your parents must have been mildly perturbed? I remember first listening to BS, the paranoid album on 8 track tape. My best friend at the time, had a very cool older sister. She would some times take us for a ride in her Chevy Malibu. Maureen liked to listen to Black Sabbath very loud! I came across this old interview with Ronnie James. It is kinda long, but very interesting. He was a very charismatic and articulate man. It makes sense to me now, the obsession with good and evil/God and Satan,knowing that he was raised Catholic. @Sary wrote: You were very lucky to have had a turn table at your holiday retreat....what luck to be able to enjoy your metal music. I went on my own and stayed at my aunty and uncle's who live there. I think I annoyed my uncle a bit by playing the music too much. Oh well! It makes sense to me now, the obsession with good and evil/God and Satan, knowing that he was raised Catholic. I enjoyed watching that interview. 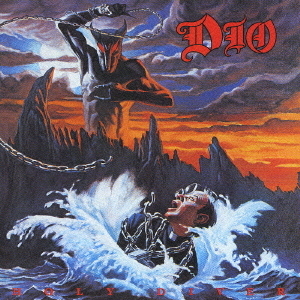 I remember in another interview of his I read he was saying someone had asked him about the Holy Diver album cover and why it depicted a devil chasing a priest, and he'd replied: "How do you know it's not a priest chasing a devil?" What’s ur favorites metal bands ? What kind of music do you like to listen to, Aelwenn? I like a wide variety , every decade different. I love the oldies. Hard Rock and blues are probably my favorite. Country and classical not so much.